Black Uhuru was the leading second generation reggae vocal groups, and was formed in Jamaica in 1974 by Euvin "Don Carlos" Spencer, Rudolph "Garth" Dennis, and Derrick "Duckie" Simpson. These three grew up in the famed "Waterhouse" district of Kingston, Jamaica (a hot bed for reggae artists over the years). After a couple of years the group as it was originally known grew apart as Don Carlos went on to a solo career, and Garth Dennis went on to sing with another of the great Waterhouse group, the Wailing Souls. Duckie Simpson continued to work under the Black Uhuru name (Uhuru means Freedom in the Swahili language of Africa), and he enlisted an up and coming singer, Michael Rose, and Errol "Jay's Wilson to record the "Love Crisis" album with producer Prince Jammys (then a protege of the famed pioneering reggae producer, King Tubbys). One of the best known best tracks from this album, "I Love King Selassie," has survived to become a bonafide reggae anthem. This Black Sounds of Freedom album is a remixing of the Love Crisis album and was eventually released in the UK in 1980 on the Greensleeves label. After that period, American expatriate, Sandra "Puma" Jones, joined Michael and Duckie to add haunting high harmonies to the group, and Black Uhuru joined forces with Sly and Robbie, releasing some the best reggae music of the 1980's and were the first group to win a Grammy award when the Reggae category was introduced in 1985. Michael Rose left the group for a solo career in the late 80's and another young "Waterhouse" area singer Junior Reid joined the group for three years starting in1986. Puma Jones passed away in 1990, and about that same time the original three members Don, Garth, and Duckie joined together one again to record and tour throughout the early and mid-Nineties. 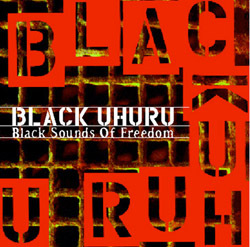 Black Uhuru continues today under the direction of Duckie Simpson and with another "Waterhouse" product named Andrew Bees. Black Sounds of Freedom is a crucial album that showcased the raw power of Reggae groups in the Rockers period of Jamaican music in the late 70's, and is one of the cornerstone albums that is laid in Reggae music's foundation.